PAW Financial is the leading cross-vendor event covering the deployment of predictive analytics for financial services. Hear from the horse’s mouth precisely how Fortune 500 analytics competitors and other top practitioners deploy predictive analytics at banks, insurance companies, credit card companies, investment firms, and other financial institutions. Predictive Analytics World for Healthcare focuses on real-world examples of deployed predictive analytics. Attend and witness today’s rapidly emerging movement to fortify healthcare with big data’s biggest win: the power to predict. 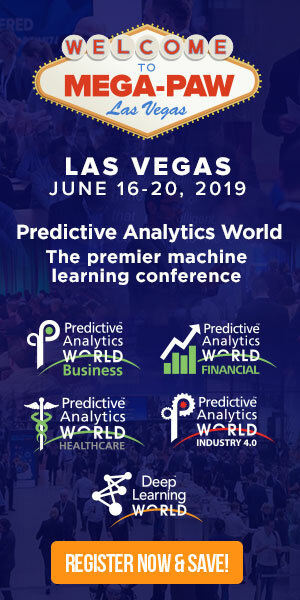 The premier cross-vendor networking event, this conference assembles the industry’s leaders to deliver case studies and expertise, revealing how predictive analytics improves patient care, reduces costs and brings greater efficiencies to the healthcare industry.